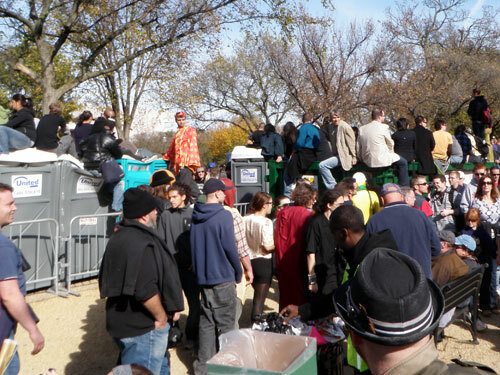 Last Saturday I attended the Rally to Restore Sanity in Washington DC. 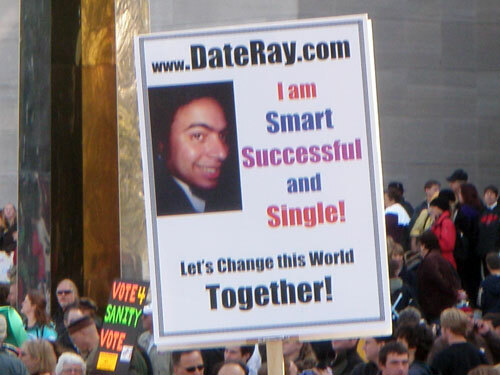 Correction: I spent most of my time at the satellite rally taking place on the orange line of the DC Metro a.k.a. The Sardine Can Express. I must say, dear readers, I was rather disappointed in you. Why wasn’t anyone who read about my meet-up plans prescient enough to tell me that I was a bone-headed moron for expecting to get on the Metro at 11am and make it to the rally by 12pm? Evidently, over 100,000 other rally attendees had the exact same plans, and we swarmed the Metro like ants on a dead grasshopper. After my morning meet-up at Whole Foods, I walked to the Clarendon stop of the orange line with Lisa and Katarina, blog readers who will forever be known as my Rally Buddies. We are bonded together forever like survivors of a natural disaster. After waiting 10 minutes in line to simply get a fare card, we waited on the platform with at least 60-80 other people for the next train. When the train arrived, it was so packed that no one else could get on. We were not deterred, though, and instead we got our clever on. My Rally Buddies and I crossed over to the opposite side of the tracks to get on the train going the other direction. We figured we’re ride up 3 stops to Ballston station, get off, and then get on the train headed to DC before it became totally packed. Clarendon, the station we started at, was eight stops away from our destination, so it wasn’t that big of a deal to add a few more stops before looping back. We pulled into the next station, and the platform was packed. We pulled into the station after that, and the platform was packed. We pulled into the station after that—and, well, you get the picture. It quickly became clear we were riding this train for all six stops out to the end of the line in God-only-knows-where Virgina. As we got closer and closer to the end of the line, people on the platform started literally cheering at our arrival because there was space on the train for them to board. The train became more and more packed, and at one station the dinging sound alerting people to clear out of the door kept going off over and over again. The train remained stopped for almost 5 minutes. Then the driver came on over the intercom and said, “Passengers, this train is out of service. Please disembark from the train.” So, Virginia, that massive groan you heard around noon last Saturday? That was us. Someone had blocked the doors for so long while they tried to cram inside that they had broken the door, which now wouldn’t close. My Rally Buddies and I got off the train, but stayed as close as we could to the platform so we’d have first dibs on the next train. 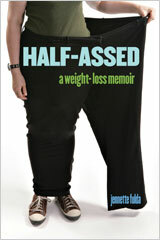 This was when someone said, “Jennette?” and I turned to see my book editor walking off the same train I’d been on. Yes! 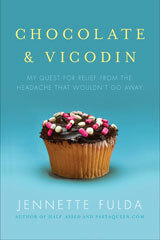 I ran into my book editor on a train platform during an event attended by approximately 200,000 people. It was bound to happen, right? We got a chance to say hi and snap a quick photo when another train pulled up, which miraculously had space for us to board. Then it was every blogger and editor for herself, so I lost track of my editor as my Rally Buddies and I secured seats. But it was nice briefly meeting her in person for the first time! By this point, we were already an hour late for the rally. I checked Twitter on my phone to learn John Legend was on stage. I didn’t really care. Then I learned the Mythbusters were on the stage. I cared! When we got to the end of the line, I felt desperately sorry for everyone on that platform because the trains headed in both directions were so packed that they couldn’t board in either direction. They were literally stranded. Right after the doors closed at one station, a man half-seriously scratched at the window of our car, and then pointed to a place on Lisa’s lap while mouthing the words, “I could fit right there!” All we could do was wave good-bye, as though we’d left him to die as the rest of us refugees fled the area. Eventually we pulled into Ballston station, and I turned to my Rally Buddies and said, “Remember the old days, when we thought we’d be able to turn around at Ballston station? Oh, those were the times.” The train continued to stop at each station on the way into DC, which seemed rather silly since practically no one was getting off. I kept checking Twitter, and felt slightly better that other people were delayed too, like Roni who was stuck in a line just to get into the train station. Then, finally, after a total of 20 stops, after much toil and trouble, after two trains and far too much time, we arrived at Smithsonian station! Oh how joyous it was to disembark from the train after two and a half hours spent in the Metro system. We then joined the rally, only an hour and a half late. It was fitting that we got there right as Ozzy Osbourne was singing “Crazy Train.” At least, I think it was Ozzy Osbourne. 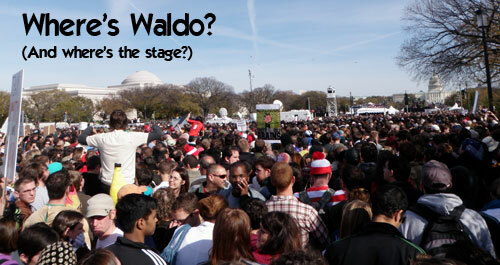 I really couldn’t see anything but a mass of people….and Waldo. The rally was crowded, and those people who’d arrived at four o’clock in the morning to secure seats suddenly looked a lot less loony. My Rally Buddies and I spent 20-30 minutes slowly pushing forward through the crowd, riding slow currents of movement like water. I exercised my calves standing on tippy toe to see glimpses of the Jumbotron screen off in the distance. Eventually, we moved off to the sides, jumped off a short wall and walked down a blocked-off street to get closer to the stage. We couldn’t see anything, but we could start hearing more. 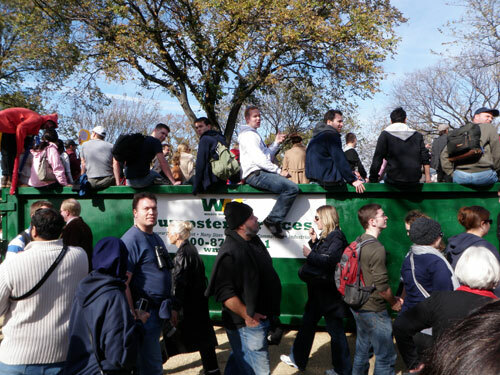 There were people sitting on top of Port-o-Potties, and possibly inside them as well. 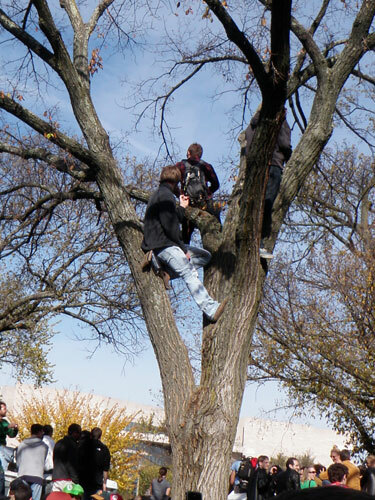 There were men in trees. 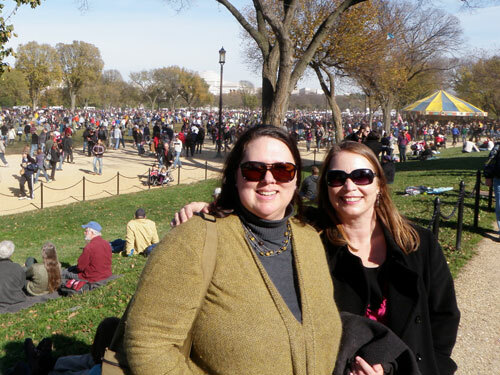 We wandered around the crowd for awhile and once we’d had our fill we turned around to get back to the Metro. By this time, the rally was almost over anyway, and we wanted to cram on a train before the thousands of people still on the mall got to the station. This time there were police at the station controlling traffic and preventing overcrowding on the platform. We were able to fit onto the first train, and I was very grateful I don’t have claustrophobia. Lisa and Katarina, my dear Rally Buddies, got off at the second stop to transfer to another line. I continued up the line until I got off at Clarendon once again, and walked to my car. Later that day, I visited my dad in Maryland who had watched the rally on TV. “I saw Cat Stevens was there!” He said. “Cat Stevens was at the rally?” I replied. So, um, yes, the people at home got a much better view of the show than most of the people at the show. I really only caught bits and pieces of the speeches and songs. However, I’m still happy I went. I’ve never been a part of an event as large as that, so it was good to experience what it was like. Sadly, I wasn’t able to Tweet from the rally or check into Foursquare for a special badge since the network was overloaded. Normally I kinda’ hate Foursquare, but I really wanted my damn badges. Oh, well. On the news that night I learned that the Metro was hit with an extra 200,000 more riders than average before 3pm. That sounds about right. Special thanks to my Rally Buddies, Lisa and Katarina! If I had gone through the endless Metro trip by myself, it wouldn’t have been anywhere near as fun. Thanks for walking me back to the orange line. And let’s never do this again! That is the exact reason that we left town this past weekend! :) That and the Marine marathon that they were having… we figured there would be no good way to get around so we just left. Glad you had fun though! We considered the metro, but in the end decided to drive on into town and despite some slow traffic, we made it in and out with no problems. It wasn’t much worse than normal rush hour traffic on New York Ave. Probably not what you wanted to hear, but we were honestly pretty shocked ourselves that it worked out so well. Next time you’re over this way I’ll have to pay attention, I’m in Maryland too. Don’t think I would have wanted to go to the rally though lol. But glad you thought it was worth it that’s what counts. I’m sorry that it didn’t occur to me that the Metro might be too crowded; I rarely go into town during big events so didn’t have any first-hand experience. So that’s why I didn’t warn you at breakfast. Mea culpa. Thank you so much, Jennette, for giving us a first-hand account of the day. I’m sorry that you didn’t get to participate fully with the rally but you sure helped test the Metro for the next time something like this comes up! I’m glad that you had the chance to buddy-up and make a couple of new friends. It’s always better to share a trying experience than go it alone. That was really weird coming upon your book editor as you did. Kismet is wonderful that way. We parked at 17th st (friends house) and walked the 17 blocks to the mall (everyone in my group was in way better shape, bet you can guess how that went! ( We made it about 15 feet in front of the porta potties and then realized there was absolutely no way we would get any closer to the stage. good times. A lot of this sounds familiar, and in fact, I may actually be able to top your metro experience in terms of crowds… I was at Obama’s inauguration. Lemme see if I can recall the details… It took about an hour to get from the freeway offramp to parking about a mile’s walk the end of the line metro station. Then it took us another hour to get on a train, and another 3 hours (packed so tight on the train that I had 5 people crammed up against some part of me the whole time) to get from our stop to one of the outer DC stops where we finally decided to get the hell off the train and walk the rest of the way. So, it was over 5 hours from freeway exit to the Mall…and this all started about 4am. We arrived on the Mall about 9:30am. The we froze out asses off for about 5 more hours. Sounds like a blast, huh?? ;-) But, honestly, I wouldn’t trade that experience for anything. @sb – I should also mention that it sounds like the inauguration had a much better set up for those farther down the mall to be able to see on multiple jumbotrons. I’m sorry, for your sake, that Jon and company didn’t plan for the crowds as well. Let us hope that the rally will help. It really seems a shame that Washington and sanity have so little in common. Even my dog seems to have some common sense, but these politicians are not canines – even though some of them might be classified as “Dogs”. I’m glad you had a good time, but…wow! I’m glad I didn’t go. Not being able to contact my friends once I got there, and sitting on a crowded train, and then not being able to hear the speakers…I would have been pissed off. And I don’t like being pissed off! Jeannette – I was there, too! I was staying at a hotel about 10 blocks away and walked down with my 3-year-old daughter, so we avoided the subway issue. Sounds like an experience you’ll never forget. You are very brave and a little bit crazy! How awesome! I’ve loved all the wrap ups and the crazy signs. Sounds like a fun experience!